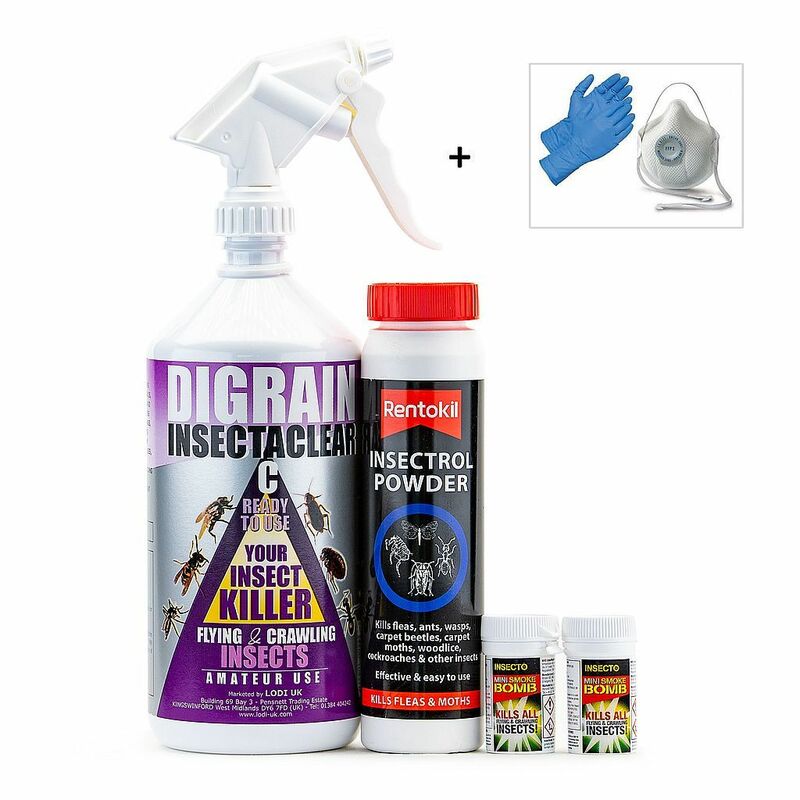 Clothes Moth Kill and Control Treatment Kit 1 is a combination of pest control products for the eradication of an infestation of clothes moths, their eggs and larvae in 1 - 2 rooms. A total treatment pest control product combination for the eradication of an infestation of domestic Clothes Moth case bearing clothes moth, wooly bear, cloth or webbing clothes moth. These house moths are also known as the common clothes moth, brown housemoth or the white shouldered house moth. Our Clothes Moth Control Treatment Kit 1 will kill, stop and get rid of these household pests in 1 - 2 rooms. For Clothes Moths, the kit is sufficient to treat and protect 20sq. metres. For Carpet Moths, Protoector C / Insectaclear C insecticide killer spray, is the best all round pesticide on the market, to treat Clothes Moths found in all areas. The insecticidal killer powder is for use in cracks and crevices, in between skirting boards and under carpet edges where they have damaged carpets. The Mini Smoke Fumers will fog treat and get rid of Clothes Moths within the affected room as well as for use in treating a loft or roof space above, which is often the source of Carpet Moth or Clothes Moth infestations and problems. For Clothes Moths, Protector C / Insectaclear C insecticidal killer spray should be sprayed inside empty wardrobes, cupboards and drawers to kill, stop and eradicate Clothes and Fabric Moths. The insecticidal killing powder should be put around floor and wall joints where these household bugs can live and breed. The Forte Fog P Mini Fumers can be used as a whole space fogging fumigation pest control treatment method. An information sheet is included giving advice on how to treat, kill and get rid of a Carpet Moth or Clothes Moth infestation and how to stop and give protection to clothes from Cloth Moths. 1 x Advice Sheet on how to use these Clothes Moth Pest Control Products.